The centre of international gravity is shifting toward East Asia. With China rising, Washington must focus its economic and security policies there, not the Middle East. Political sentiment in the United States seems to be turning against the interventions and nation-building projects that have characterized US foreign policy in recent years. The revulsion at the cost and size of government, including the cost of expensive wars in the Middle East, has been amply demonstrated during the debt ceiling drama of recent weeks. President Barack Obama has spoken of the need to nation-build at home rather than in Afghanistan, while most Republican presidential contenders showed an aversion to the Libyan operation and an unending expansive role in Afghanistan during their first primary debate in New Hampshire. Congressional grumbling is growing against further doubling-down in Afghanistan and the meandering intervention in Libya. This is very much to the good. At times over the past two decades, US foreign policy has lost its moorings in distinguishing the vital from the desirable, with the result that conceptions of US security and humanitarian interests have become so expansive as to be seen to obligate preventive war against rogue states, coercive intervention against recalcitrant dictators, and inordinately ambitious efforts at forcibly modernizing backward societies – with baleful results. If this disorienting fever is subsiding in favour of a return to the more restrictive war-making and intervention criteria typified by the Weinberger/Powell Doctrine, then there’s cause for satisfaction. But the pendulum shouldn’t be allowed to swing too far toward an incautious retrenchment. For our problem hasn’t been overseas commitments and interventions as such, but the kinds of interventions. The US alliance and partnership structure, what the late William Odom called the United States’ ‘liberal empire’ that includes a substantial military presence and a willingness to use it in the defence of US and allied interests, remains a vital component of US security and global stability and prosperity. This system of voluntary and consensual cooperation under US leadership, particularly in the security realm, constitutes a formidable bloc defending the liberal international order. But, in part due to poor decision-making in Washington, this system is under strain, particularly in East Asia, where the security situation has become tenser even as the region continues to become the centre of the global economy. A nuclear North Korea’s violent behaviour threatens South Korea and Japan, as well as US forces on the peninsula; Pyongyang’s development of a road mobile Intercontinental Ballistic Missile, moreover, brings into sight the day when North Korea could threaten the United States itself with nuclear attack, a prospect that will further imperil stability in the region. More broadly, the rise of China – and especially its rapid and opaque military build-up – combined with its increasing assertiveness in regional disputes is troubling to the United States and its allies and partners across the region. Particularly relevant to the US military presence in the western Pacific is the development of Beijing’s anti-access and area denial capabilities, including the DF-21D anti-ship ballistic missile, more capable anti-ship cruise missiles, attack submarines, attack aircraft, smart mines, torpedoes, and other assets. While Beijing remains a constructive contributor on a range of matters, these capabilities will give China the growing power to deny the United States the ability to operate effectively in the western Pacific, and thus the potential to undermine the US-guaranteed security substructure that has defined littoral East Asia since World War II. Even if China says today it won’t exploit this growing capability, who can tell what tomorrow or the next day will bring? Naturally, US efforts to build up forces in the western Pacific in response to future Chinese force improvements must be coupled with efforts to engage Beijing as a responsible stakeholder; indeed, a strengthened but appropriately restrained military posture will enable rather than detract from such engagement. 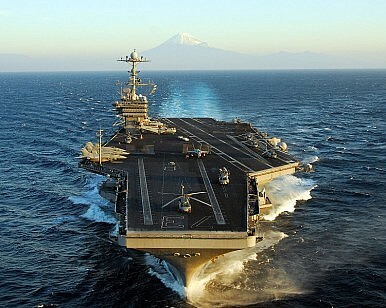 In short, the United States must increase its involvement in East Asia rather than decrease it. Simply maintaining the military balance in the western Pacific will, however, involve substantial investments to improve US capabilities. It will also require augmented contributions to the common defence by US allies that have long enjoyed low defence budgets under the US security umbrella. This won’t be cheap, for these requirements can’t be met simply by incremental additions to the existing posture, but will have to include advances in air, naval, space, cyber, and other expensive high-tech capabilities.